Former Osun State Deputy Governor, Prince Clement Adesuji Hasstrup, who is the Chairman and CEO of ENL Consortium, clocked 70 on Saturday 6th of October, 2018. 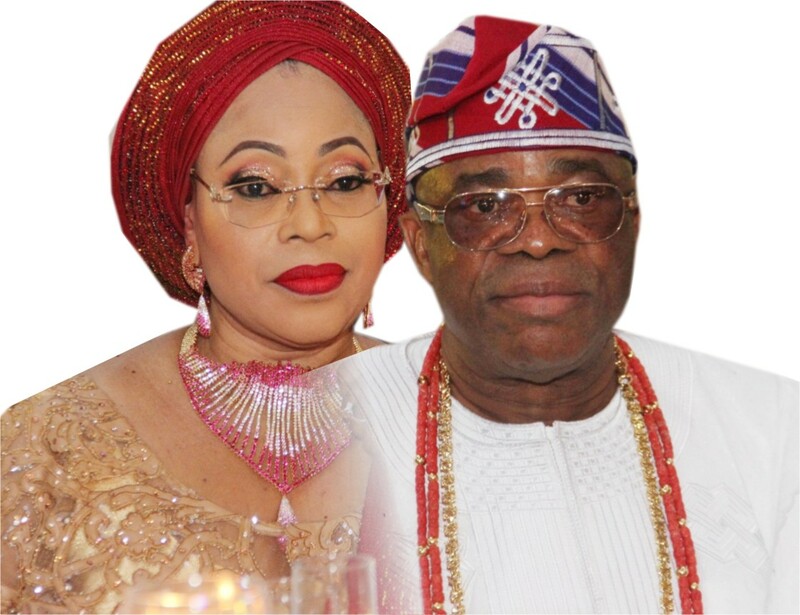 And he had a Thanksgiving Service at Guiding Light Assembly, Layi-Ajayi- Bembe Road, Parkview, Ikoyi, Lagos, while a grand reception was held at Balmoral Convention Centre, Federal Palace, Victoria Island, Lagos. The Emerald Green and Red Event, paraded many prominent Nigerians who came to show love to the celebrant and his beautiful wife, Mrs. Vicky Haastrup. Looking Regal and handsome in a white flowing Agbada, Mr. Vicky Haastrup, danced in with his beautiful wife a few minutes past 3pm, looking like a newly wedded couple. There is no doubt that they both love each other so much. They are one of Nigerian celebrity couple many admire. They have been married for over 2 decades . They also do business together. While Prince Adesuji is the Chairman of ENL Consortium Ltd. His pretty wife is the Vice Chairman. They have both been able to build their brand into an enviable height. They both founded ENL in 2002. They are one of the leading Terminal Owners, who were given concession by Federal government. Sighting Prince Adesuyi and his wife, Vicky, one needs not be told that they are so much in Love. They watch each other back throughout the event. Prince Adesuyi was caught many time admiring his wife. They chatted free and smile at each other while the event lasted. Seeing how much they love each other, many couldn’t help but ask about the love story of the celebrity couple. How did their path cross? as Prince Adesuyi speaks on Life @ 70. Well, many of the guests who admired how Prince Adesuyi love his wife didn’t wait much as Prince took his wife by surprise by telling them what his wife meant to him and how she has changed his life for good. How he left office with no car and only had 400 naira in his Bank account. “I give God the glory for sparing my life till this day. I can’t but thank God for sparing my life and that of my wife till this day. When we took over the port, my wife was almost killed but I thank God that for destiny and God loves, she escaped that incidence. That is why I say, when couples are closed, you will be each other guiding angel. While she manages the port, I go round the country carrying my briefcase from Monday through Friday. But this particular week, I finished on Thursday in Abuja. And I told myself, what am I waiting for, let me go home. I told the driver to take me straight to the airport and I took the first flight to Lagos. I called my wife that I was on my way home and she said why not tomorrow, I told her, I just want to come home. Infact that was a divine saving Grace. This is because when I am home, my wife can’t be as prompt as she use to be at work. On Friday morning, we were still talking . She was all dressed for work. We got a call saying there was a serious riot at the port. They attempted to open the sealed up, they couldn’t so they bring down the wall of our office with Machete, guns and so on. The trip which was cut short on Thursday saved her. So I give God the glory. This is just few of the things that made me believed that God is on our side. Our marriage is also Divine. Also, when I was in politics, I decided to live by example. As Deputy Governor of Osun, I didn’t take a dime from contractors. At the end of each month, my dependent knows when we are talking our salaries and day that I collect Salary. At the end of the day, when we were rooted out 3years later by Military coup, I had only N400 naira in my account. I had 4 cars before I got into government, I gave out 3 and immediately after 3rd years, I gave out the last car. My wife asked why I gave those cars away and my response was, “It is rotten away while, keeping it if we can give to those who needed it. As at when we were rooted out of the government house, those in charge of my business have run it down. By the time I came back to Lagos, I had nothing. Whenever I am going out for business, I will put “Buba and Sokoto” on and put my Agbada inside a Lylon Bag. So when I roll on Danfo and get to my destination. I will go into a small corner, to put it on. I will put on my Agbada and Fela” and look like Deputy Governor. When I go to those offices, you will here “Your Excellency” but I knew what I was going through. But God is God of destiny and he sees our hearts. I never knew I could ever get out of this but before I met Vicky,. One of my Pastors had told me that I would meet a lady and there will be turn around in my life. He said she is not from Owerri, Oyo or Osun. I said could it be Ibo or Hausa. I was waiting and eventually, when I went to see a military President, the President sent me to their office. He handed me over to Vicky's GMD who handed me over to Vicky. Those were the time I was ridding Danfo. So many at times, I could not afford to fly to Abuja, so I will send my P.A to her because I was handed over to her. Vicky later told me she was making jest of me when my P.A. says from his Excellency. She said Excellencies are here waiting for allocation, your Oga’ is in Lagos and he’s sending P.A. She didn’t give me anything. But as God will have it, one day, I was in a flight enroute Lagos and we were seated together just by share coincidence. She asked me how I have been. I said well you were there and you didn’t give me anything despite the fact that I came from the top. She said” Nigbati e ni yoju” (when you won’t show up, most of your people are also asking for something. I said that is my fate. We eventually started talking and one thing led to the other and here are we today. “I am happy, Olori Sijuade is here, you know my relationship with Vicky reminds me of that song KSA wax for His Imperial majesty, Ooni Sijuade. “ Since then, I have had peace of mind. Infact, when you are talking of a biblical virtuous woman, it is Vicky Ayodele Hasstrup. That is Vicky for you. She exceptionally takes very good care of me. She gave me peace. Truly her Aura turns things around for me. We first got big contract to another and eventually the port. When we got the port, I don’t like monotonous job, I immediately start roaming around and I believe she is the best to handle the port. People thought I will be making a mistake but I told them we suffered together and today see how she has turned things around. Not only that. In all our companies she has done magic and money which many think is the root of all evils, we don’t quarrel. Many of the guests couldn’t help but clap as the celebrant praise his wife her exemplary character and how she has changed his life for good. His beautiful wife couldn’t help but smile.